ADI is holding a Week of Action to support TEAPSPA the federal bill to prohibit traveling wild and exotic animal acts. Our TEAPSPA Week of Action is here! 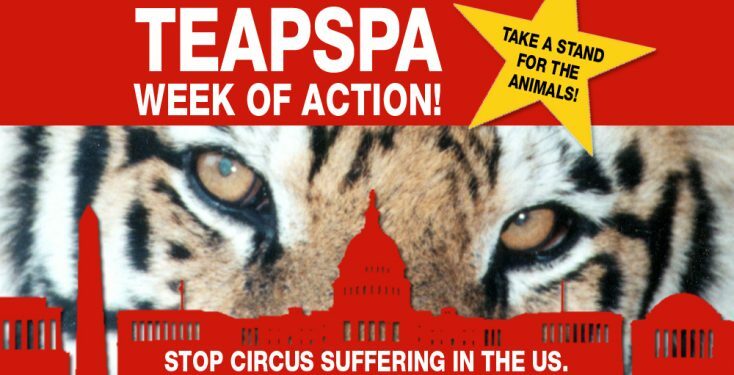 Below you will find actions to take over the next five days to support TEAPSPA (the Traveling Exotic Animal & Public Safety Protection Act, H.R.1759), a federal bill to prohibit traveling wild and exotic animal acts in the US. Circus animals are counting on you to take action for them this week, so please join ADI and our fellow supporters to stop circus suffering. “Traveling circuses have raised concerns about the treatment and well-being of wild and exotic animals, such as their ability to move and socialize. The Traveling Exotic Animal & Public Safety Protection Act will protect these animals…” – Rep. Ryan Costello. ADI worked with TEAPSPA’s bipartisan sponsors Rep. Raúl Grijalva (D-AZ) and Ryan Costello (R-PA) to draft and introduce the bill. The time has come to end outdated, cruel, and dangerous traveling animal acts – let your legislators know that US citizens want to stop circus suffering! Monday: Spread the word on social media! Share our Week of Action Facebook posts and tweets with your friends and followers, as well as our Reluctant Entertainers campaign video, available here. You can also update your profile picture on Facebook to support the cause; simply click this link and type ‘Animal Defenders International’ into the search box to find the ‘I’m working to stop circus suffering’ profile picture frame. Please call your representative to set up a constituent meeting today! They work for you, and they want to hear from you, or, better yet, meet you! Find your representative here. We will provide support to help you prepare for a successful meeting, including legislative briefings covering the issues – training, transport, health and public safety, regulatory oversight, and economics. Contact us at usa@ad-international.org or call 323-935-2234. If you’ve already met with your legislator (or their staff member), why not check in again? You can also check for their name on TEAPSPA’s co-sponsors list here. If they aren’t listed as a co-sponsor, please call to urge them to sign on, and if they are cosponsoring TEAPSPA, please call them to say thanks! Wednesday: Please reach out to your senator to ask for a senate companion bill! If you want to go the extra mile, try calling every committee member! Studies on the use of wild animals in traveling acts show that circuses cannot meet the physical or behavioral needs of wild animals. Animals are deprived of physical and social needs, confined in small spaces, spending excessive time shut in trailers and train cars. These animals often demonstrate abnormal behaviors – rocking, swaying, and pacing – indicating they are in distress and not coping with their environment. ADI’s video evidence shows these animals are forced to perform tricks through physical violence, fear, and intimidation. Together, we can stop the suffering. Thank you so much for making a difference for animals this week!